Several of us are planning a 7:30 am start for the Solvang Double Century this Saturday. I took a look at my training log to see what happened last year. The following chart shows my heart rate, speed and altitude during the first 35 miles. I was doing fine riding with the group of 42 riders who started together. We lost some of them on the first real hill at mile 18. Going down the first real descent at mile 19 was difficult because I had a very hard time keeping up with the two tandems. It took considerable effort on my part to latch back on. I thought I would solve that with the second climb at mile 20 by going out ahead of the pack. I did not get enough of a lead because the tandems and fast riders passed me on the descent and even though I was driving my heart rate into the red zone I could not get connected to them after they passed by. I finally gave up trying because I was getting totally wasted. It is clear that I gave up the chase by looking at my heart rate. By mile 35 I had averaged 21 mph. For the whole event I averaged 19.6 mph. My plan for 2008 is to go ahead on the first hill so I don’t have to chase them on the first decline. It is not possible for me to jump on a train that passes me going downhill, so my only chance is to be near the front on the 2nd climb and hug a wheel. The problem is I just don’t have the weight to be able to keep up on the longer descent. It might be another lonely ride. Click this graph to view enlarged. Yea, so I turn 60 years old today. I could sit back in my rocking chair and watch the world go by like some others choose to do. I could make excuses that I can no longer take on the tough physical challenges, or than I need to slow down going up the hill because I am getting too old. Although age will eventually take it’s toll, I want to make sure that I am not accelerating that process mentally. A couple thoughts that were on a b-day card I received from the California Triple Crown (doing three double centuries in one year). “The best thing you can do is to keep going. I love to both cycle and run and consider myself lucky to be in good enough shape to be able to do both, especially considering that I am turning 60 years old this week. I have been running for 30 years now and many of my running buddies from many years ago have given up the sport, some because their knees can’t handle it anymore. As I saw that happening to others, about 7 years ago I took up cycling for cross training so I could reduce my miles running and still get in the same total exercise. During these past 7 years cycling as over taken running, but I still enjoy both and feel they complement each other. It is easier to do in the winter, even in California. I have often run outside when the temperature is freezing, something I would never do on a bike. It is much easier to do in the rain. I never mind running in the rain, when the temperature is moderate but like most others, I dislike cycling in the rain and usually only do it when I get caught and need to get to the end. Running provides impact and is beneficial for strengthening your bones. You do not get that benefit from cycling or swimming. It is a highly time efficient. I can burn more calories per hour and I most always just run from home so I don’t spend time traveling to some ride. It is something I can just as well do alone as with others. My total workout can be much greater. Unless I am training for a marathon I rarely run more than 10 miles at a time. In terms of calorie consumption that might be around 30 miles on a bike. And yet I can ride for 100 miles, or more, most Saturdays. That is the equivalent, in terms of calories, of running a marathon, but without the pounding on the body. 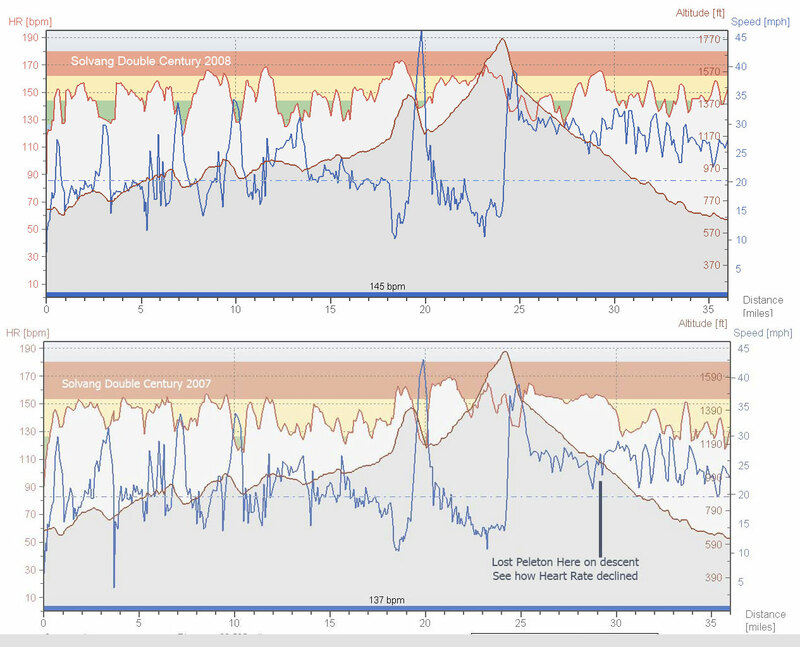 Recovery from cycling is much faster. I can do a double century ride and ride the next day. After doing a marathon, I would have a difficult time to run the next day, or even for a few days. Cycling has a very social aspect for me. I like to bike with others. It is not only safer to ride with a group, but a lot more fun. Cycling lets me see the world. I run on pretty much the same courses, never venturing more than 10 miles from my house, even when I am doing a 20 mile run. On my bike I have seen places I would have never seen before. Cycling has more thrill to me. I love to climb. Today I will be climbing up Henry Coe for the 5th time this week, somewhat of a record. That is 3,700 feet of climbing each time. I love to descend back down the hill and find it a greater thrill than any ride at an amusement park. By having these two sports, I feel I really do have the best of both worlds. When it is colder or raining, I can switch to running. When I have more time I can focus on cycling. I tend to do both every week so I am less likely to get burned out, either physically or mentally. If I am traveling where I do not have my bike, I can always run. I have run in many places around the world, include some very congested big cities that I would never be able to cycle through. When I travel and can take my bike, I get to see places I would not otherwise. I have kept a detailed training log for many years. 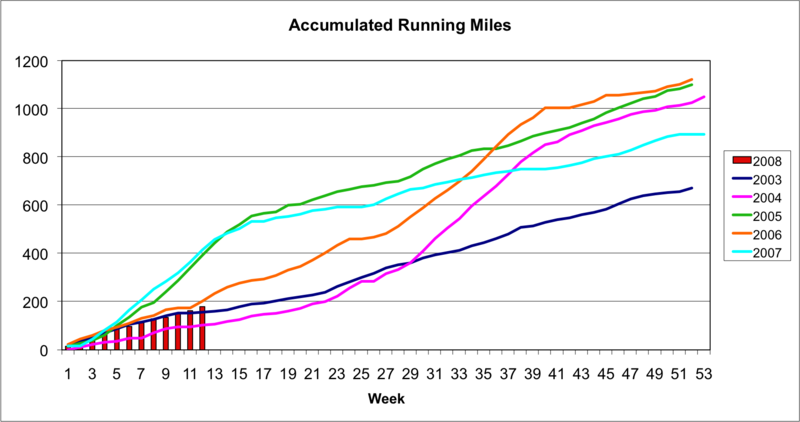 One use of the data is to create a lot of charts, such as the accumulated miles cycled so far in any year. The years when I was doing a Spring marathon shows a lot of miles running in the early months. Take a look at this graph that shows my accumulated running so far this year compared with prior years. In 2007 I was training for the Boston Marathon and in 2005 I was training for the Salt Lake City Marathon. Both of these were in April. But in 2006 I ran the St. George Marathon which was not until October. So how am I doing in 2008? So far this year my running is about on par with those years when I ran a fall marathon. You will need to click the graph below to view in enlarge. 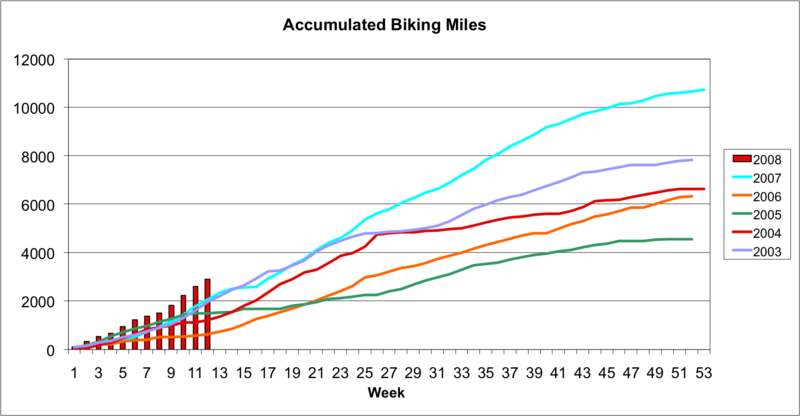 Now look at a similar chart that shows accumulated miles biking so far this year compared with prior years. More so than in any prior year I am focused on training for a difficult double century, the Devil Mountain Double. It was a ride I did last year but did poorly, since my training was more focused on getting ready to run the Boston Marathon. But 2008 is really the year of the bike for me. There has never been another year for me where I cycled in the first 3 months of the year. Click the graph to view enlarged. So with running less and cycling more, what is the total picture? I have several ways to use my training log to view equivalent exercise. This chart tries to equate the two sports in turns of calories burned. I use data from my Polar Heart Rate monitor, if entered, or formulas built into my training log, if not. For 2008 the total is similar to last year but higher than years before 2007. Any very difficult ultra distance event will challenge you not only physically but also mentally. When things do not go quite as expected, such as warmer weather than you trained for, overcoming the mental challenge will make the difference between two riders, who who decides to DNF (did not finish) and one who finishes the event. Of course there are times when the smart thing is to stop, but when things get rough it is a great temptation to say the smart thing is to quit when we have the ability to go on. I once had trained for a marathon that was known for his long downhills. Unlike cycling where the downhill is a chance to rest and recovery, in running it gives your legs a real pounding. I thought I had trained for the event properly, including some long downhill training runs. At about mile 6 of 26.2, I felt my legs starting to cry for mercy. I was frighten on what to do since in my training runs I never had such an issue so early in the run. How could I possibly run another 20 miles like this? The thought came to me that I had worked too long and too hard to stop now. I had to decide between letting the situation cause me such grief that I would slow down or stop, or I could decide to just ignore the legs and hold the pace. I choose the later and was able to not only run strong but have a very strong finish. The difference for me for this marathon was overcoming the mental challenge. During your training you will have some chances to practice overcoming the mental challenge. If you find yourself quiting during uncomfortable training sessions, you might question what you will do when you face a significantly greater mental challenge. If you are not prepared to overcome the mental challenge, then the Big Climb may not be the right event for you. After doing a 4.5 mile run this morning I decided to do an interval workout on the bike. After I cycled enough to warm up I cycled as hard as I could for 7 minutes, then rode easy for about 4 minutes. I repeated 4 times. This graph shows my heart rate during the four intervals. For each of the four intervals I was able to take my heart into the anaerobic zone but could not push it higher than 161. When I climb a hill like Metcalf I can take my heart rate up to above 170 for more than the 7 minutes I was using for each interval. I am not quite sure why I can’t seem to get my heart rate up as high cycling on a flat course. Click each image to enlarge. And here my splits for the 7 minute intervals. I remove the recovery splits for clarity. The terrain was mostly flat but there was enough variation with the grade and the wind to effect the speed. Except for the first interval I was able to keep the speed above 20 mph and my average heart rate above 150. I was finally able to get my time to climb Metcalf down below 14:30. I had to take my heart rate up above 170. I guess it was chasing Joe Farinha that I needed to get me to push so hard. (click graph to enlarge).